We used to haul around giant, hard-sided suitcases full of clothes we never used. Even the things we used were bulky and high maintenance (jeans, cotton shirts, bulky shoes and jackets). Sometimes we’d wait hours at airport luggage claims for our baggage while the carry-on crowd went on their way. We’d wrestle our luggage down narrow streets, stumble over them in small rooms, dig through them looking for stuff. Now, whether the trip is for a weekend or a month we pack everything into a carry-on size backpack (less than 50-liter capacity), one each. If it doesn’t fit inside of that it either doesn’t go or we buy it there, and we’ve found we’re happier travelers for it. 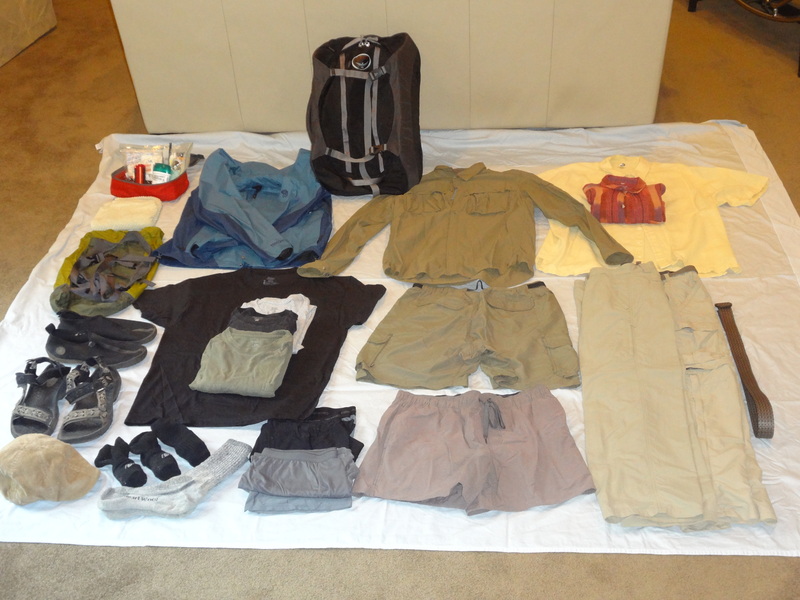 Flexibility and double-duty are the priorities for traveling light and synthetics are the key. Gone are the days of cheap, scratchy nylon clothes. Nowadays there’s a huge selection of easy wash, quick dry, comfortable and stylish synthetic clothes made from a variety of synthetics or blends of synthetics with wool or cotton. I still throw in a couple of cotton T-shirts, but that’s it. Maintaining synthetic clothes on the road is easy. when showering in hotels I bring my clothes in with me and wash them out and hang them up. they’re clean and ready in an hour or so. Every few weeks I’ll launder them. Footwear is another matter – shoes are heavy and bulky. 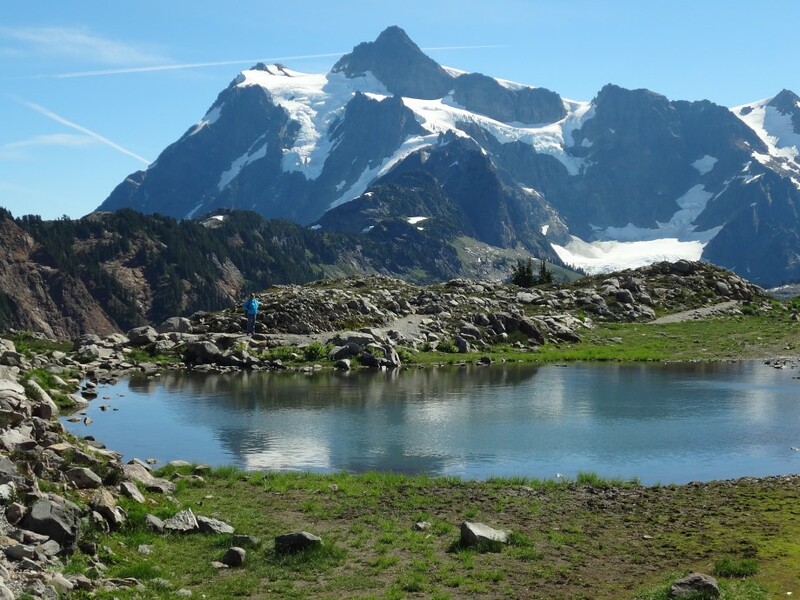 Since we usually do everything from hiking through jungles to going out on the town, careful shoe selection is one of the most challenging parts of our packing. We’ve finally refined it down to this: One pair of heavy-duty tennis shoes (like trail running shoes) which we wear on planes and busses. One pair of heavy-duty sandals (TEVAs or KEENs) and one pair of slippers (for Sonia) or water slippers (for me). The heavy-duty tennis shoes are great for walking around town all day and will work for occasional overnight trips into outback. A pair of TEVAS (or KEENs) will clean up for informal nights out on the town and are great for just about anything else including wet situations. The slippers; real handy for walking around in those bungalows, huts and budget hotels you find yourself in along the way, and the water slippers double for reef walking and snorkeling. Luggage: Here there as many opinions as there are travellers. As mentioned above, we use carry-on size packs. I prefer a sturdy, front-loading pack with stowaway shoulder straps and no wheels. It’s easy to carry though busy city streets, easy to find things in, and with the straps stowed away there’s nothing to get caught in baggage handling equipment. The pack is sturdy enough to double as a backpack for limited trips into the outback. Sonia likes a wheeled pack or suitcase with retractable pull handle. We bring a small, compactable day pack each. Sometimes we’ll take special gear for particular trips. We recently travelled around Mexico’s Yucatan Peninsula through some fairly remote areas, so we took compact snorkels and masks which allowed us to snorkel at areas where this equipment wouldn’t be available. Both sets of snorkels and masks fit into my 45-liter pack, . . . tightly, but they fit. Another time we were treated to a stay at a five-star luxury hotel in Mexico City as part of a longer trip throughout the country. So we traded out the utilitarian TEVA sandals for nice closed toe leather ones, took slacks of synthetic wool blend and Sonia finished off with a colorful scarf. We were presentable and all these clothes were usable on our more rustic excursions later on. Most of our trips are in relatively warm weather, but we’ve been to Chicago in wintertime, Paris in the wind and rain, Mexico’s Sierra Madre when nights fall below freezing. Still we still we pack light. Really all that changes is adding some warm clothes and there is a wonder material for that– goose down. Expensive, yes – but goose down clothes are the warmest thing there is and they compress to almost nothing, are super lightweight and last forever if cared for. Synthetic fleece coats or pants are also very good and less expensive, although more bulky. Quick dry long underwear helps a lot and you can vastly extend the warmth of your normal clothes by wearing a pair of lightweight “wind pants” over your normal pants (nylon over-pants or lightweight ski pants) and a good quality rain jacket (which also stops cold winds). I prefer a wool Peruvian cap and fleece gloves for head and hands. small roll of duct tape, writing pens, and a quick dry face towel). 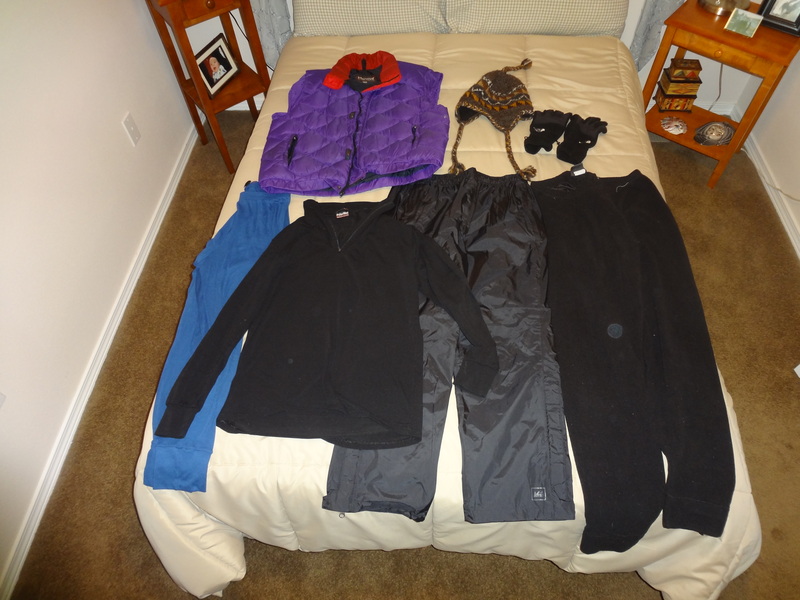 Cold Weather: Add in a goose down vest, wool Peruvian hat, fleece gloves, quick dry long underwear (top and bottom), exchange short sleeve shirts out for long sleeve, and wind pants (lightweight nylon pants).